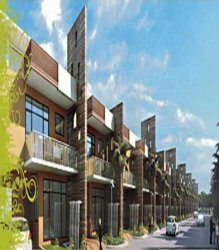 Mahagun Builders has launched villas/independent houses with unique features at Noida extension. Villa/independent houses will have modular kitchen with chimney & hob. Wooden flooring in master bedroom.11 ft. Height Vaastu compliant, no non compliant feature katni marble in all non bedroom areas like drawing, dining, stair case gym room in each villa etc. With world class amenities. •5 kms away from Metro Station.